The private rental sector in the UK is becoming more sophisticated by the year, so it’s important for landlords to stay on top of the 2019 interior design trends that could appeal to the modern renter. By incorporating some of these up-to-date styles into your property, you should help your rental stand out on the lettings market, and could even achieve a successful let much quicker (and for a better price!). So, how should you be sprucing up your interiors in 2019? Read on! Although bright, airy homes are still desirable to most of those looking for a new place to live, stark, empty properties have gone out of fashion this year. Instead, layering is a new interior design trend that should be easy to incorporate into your rental. Layering is simply adding various textures and colours to an otherwise simple room to add some depth and style. Because this look relies on being quite thrown together, it shouldn’t be too difficult or expensive to do, either. Start by adding some cushions and throws to the living room sofa, to create a homey space, while hanging some artwork to the walls in the master bedroom can make the property feel more upmarket. It’s common knowledge that landlords should decorate their rental properties in neutral tones, to ensure that the home appeals to as many potential tenants as possible. The idea is that, with a clean slate, the renters can put their own spin on the place with their belongings and knick-knacks. While cool greys have been the fashion over the past few years, 2019 is all about warmer, cosier neutrals (think more honey-toned). By repainting a couple of rooms in your property, you will instantly bring the home into the New Year, while maintaining an inoffensive palette. Plastic came to the fore of social consciousness last year, and sustainability remains on everyone’s agendas. This means that eco-friendly materials will be entering more people’s homes, and not just in the form of recycling. 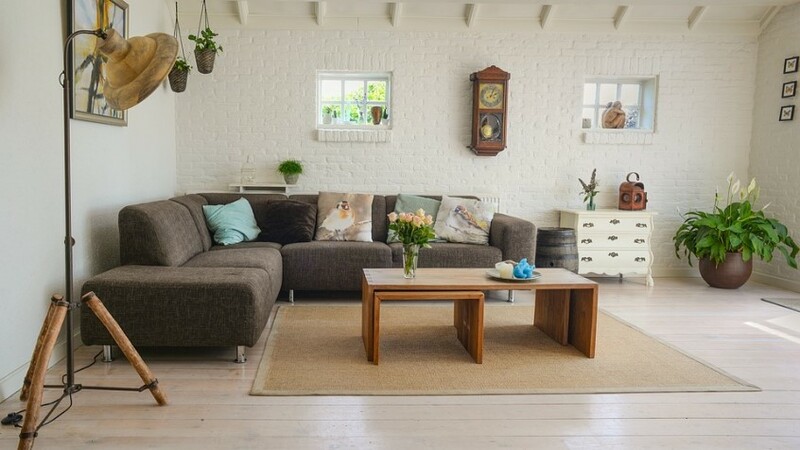 Sustainability can be considered when choosing furniture, ornaments and soft furnishings for a property, and could entice more tenants to book a viewing. If they’re really eco-focused, they may even be willing to pay a higher rent price for the home if it suits their needs. When looking at new objects for the property, take their carbon footprints into account – you may be surprised at what you can do! Black is one of those scary interior colours that people can run and hide from, but 2019 is all about embracing the dark side – in a stylish way. Black is not only on trend this year, it can also be really practical, so don’t instantly shun it. For example, black cabinets in a kitchen will not only stand out and give prospective tenants home envy, but they will also hide wear and tear more effectively than lighter colours, like cream. If you’re refurbishing the kitchen – or even bathroom – in your rental, why not be brave and introduce some black for 2019? We hope that Just Landlords has given you some 2019 interior design trends that you can feature in your rental property – we wish you luck with marketing your investment this year.